TIME and again over the last ten years the strength or weakness of Chinese chemicals and polymers demand has taken everyone by surprise. One method of analysis that does hold considerable value as a methodology for forecasting growth might be predictions of future credit flows for some chemicals. The big uptick in all Chinese chemicals demand after the 2008 Global Financial Crisis was down to economic stimulus. This applied both to chemicals that mainly go into durable, expensive end-use applications, such as autos and housing, and those that are more dependent on non-durable, cheap end-use applications. 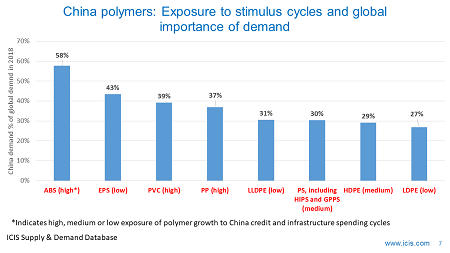 Polyethylene (PE) largely falls into this second category. The above chart shows that the volume of new demand gained on a year-on-year basis has fluctuated because of the change in credit flows. So of course 2008 was woeful with just a 136,000 tonne build in demand. The following year, when stimulus kicked in, saw a 3.7m tonnes gain. 2010 then saw an addition of 2.3m tonnes of new demand. This obviously partly reflected restocking following the heavy destocking that took place when oil prices collapsed in late 2008. The same pattern was common around the world. But the extent of the China rebound was the result of the unprecedented scale of Chinese stimulus. 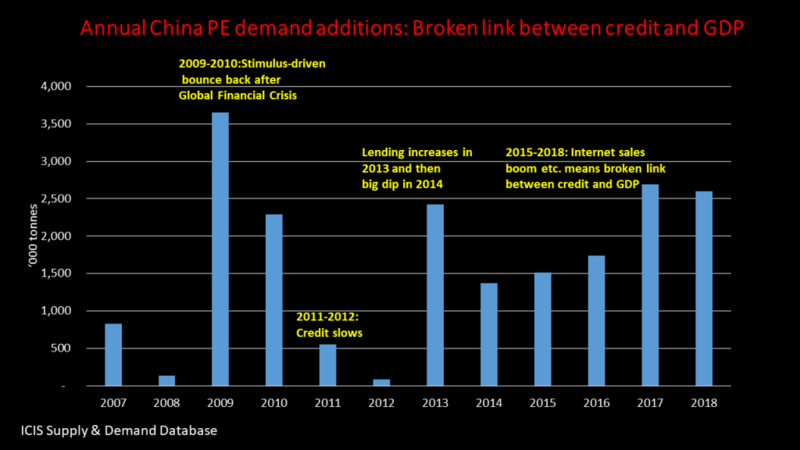 My working theory is that Chinese growth in PE demand has become divorced from credit cycles. GDP growth obviously moves up and down in China depending on levels of economic stimulus. 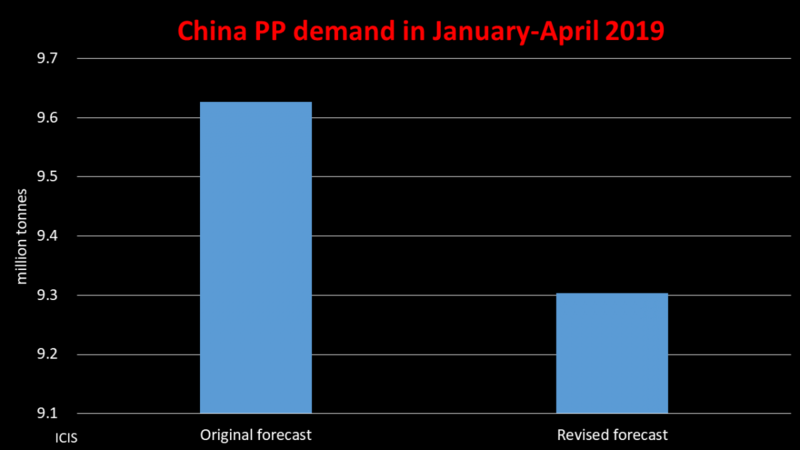 This could as a result mean the link between GDP and Chinese PE consumption has also been broken. The growth in China’s mobile internet economy is resulting in very strong growth in demand for PE protective packaging. Even though, for example, the economy slowed down last year, there was a big growth in demand for takeaway food bought over the internet delivered by courier (Chinese versions of Uber Eats). This was because people had less money to spend in restaurants due to a slowing economy. Changing social trends were also important as well, though. Now buying restaurant food online has become so popular it is difficult to see why demand won’t continue to grow. The convenience of shopping on line in general for cheap, daily necessities promises further growth in what is a key industrial sector for the government. Beijing sees the internet-based economy as a way of escaping China’s middle-income trap. Government money is being spent in western, poorer China to boost online selling. The objective is to provide easier access to low cost goods to people in remote rural areas who may lack access to shops. Income thresholds. 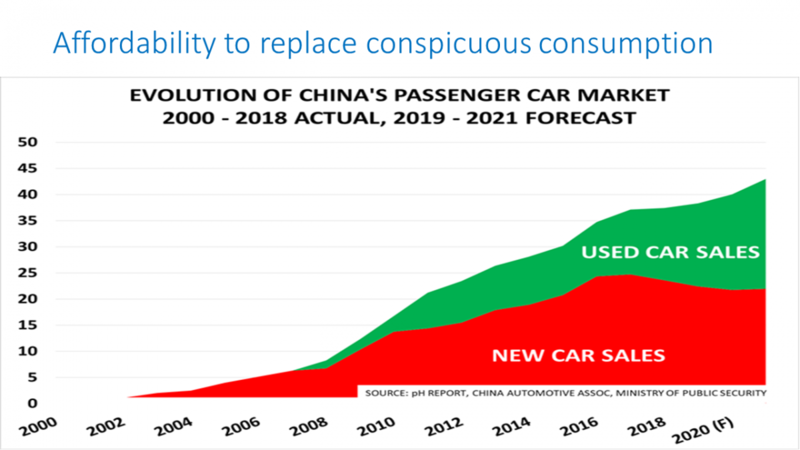 Even if China’s overall economy decelerates as its population ages, many millions more people in poorer China will still see their incomes rise over the threshold point where they can afford cheap, modern-day goods packaged in polymers. Once this demand is created it is rarely lost – i.e. once you’ve started buying a whole bottle of shampoo, you don’t go back to buying sachets. 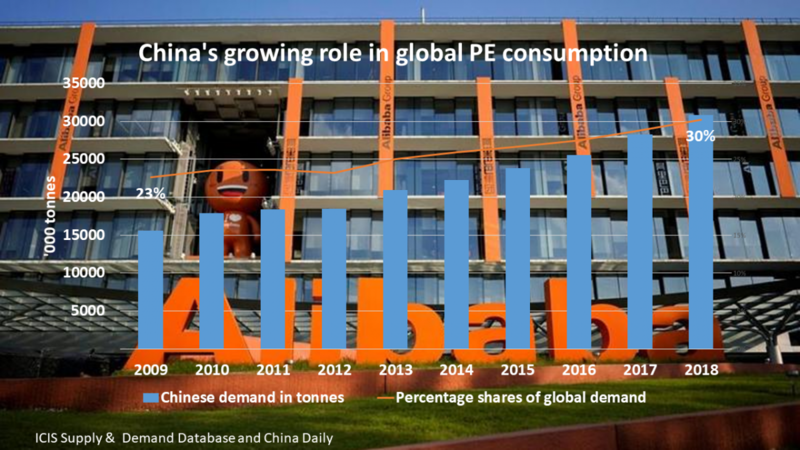 Last year’s strong growth for PE wasn’t just driven by the booming in internet sales, however. Another major factor were the heavy restrictions on imports of scrap or recycled PE that were introduced for environmental reasons. 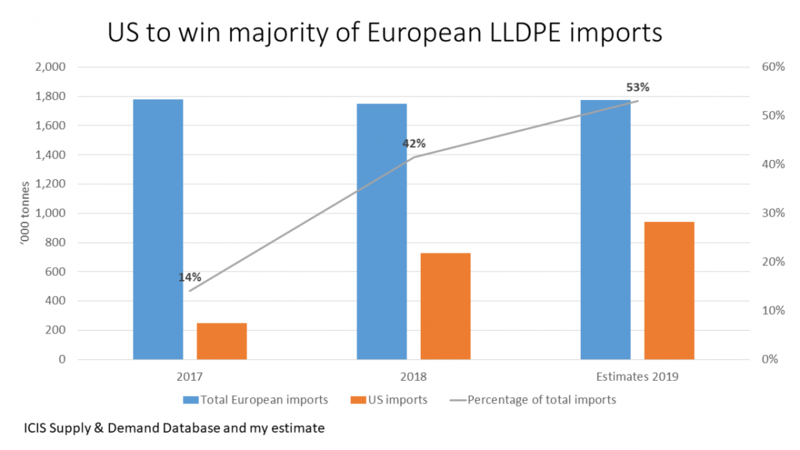 Recycled PE imports fell to around 30,000 tonnes in 2018 from 2m tonnes the year. This as one-off benefit, but, of course, the market is now much bigger, thanks to the restrictions. 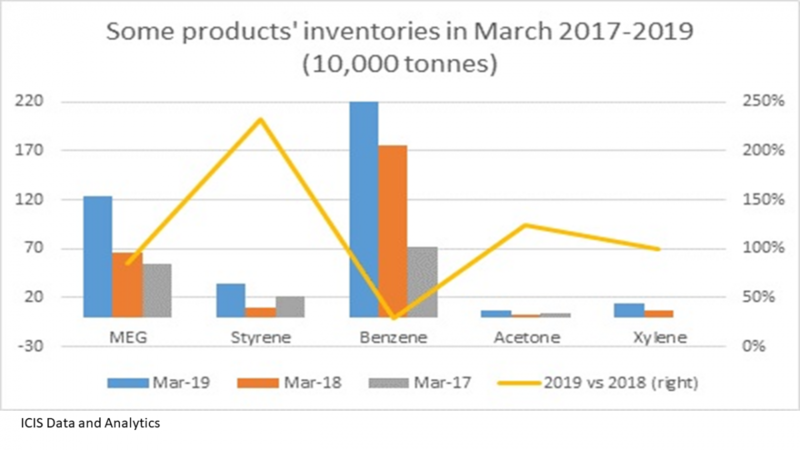 Even if percentage growth slips in the coming years, this bigger base raises the potential for further annual additions well in excess of a million tonnes. Note that all the above doesn’t just apply to PE. The same applies to general-purpose polystyrene (PS) and expandable PS that are also heavily used for protective packaging of sales over the internet. So how should we now stare in the crystal ball measuring growth as multiples over GDP no longer work? Monitoring the growth of internet sales is obviously a starting point. We then need to assess how much PE is required, by weight, to package the average sale of an item over the internet. Multiply the two together, divide into tonnes, and predict future growth in internet sales. The world of petrochemicals needs to now be balanced around China rather than China being balanced around the rest of the world. This is a change that has taken place over the last ten years, as Chinese PE and other petrochemicals demand has become the biggest of any other country or region. The tipping point for PE was in 2009. The end-result of this shift is that we can longer treat China as one country. You wouldn’t treat the EU as one country, even though it is far less important a demand driver than China. We thus need to understand growth prospects in different regions of China. Another of my working theories is that we can divide China into the rich southern and eastern provinces, the northeast that faces downward growth pressures from the closure of oversupplied industrial capacity, the middle up-and-coming provinces immediately next to the coast, and very poor China in the far west. Dividing China up in this way and coming up with different growth forecasts for different regions isn’t only justified by the importance of China for global markets; it also because growth prospects between different regions vary greatly – and so knowing these varying growth numbers will help companies invest in the right logistics networks and sales and marketing operations. For example, whilst growth in rich eastern and southern China is slowing down, there is huge potential in middle China. How do we get to these regional growth numbers? 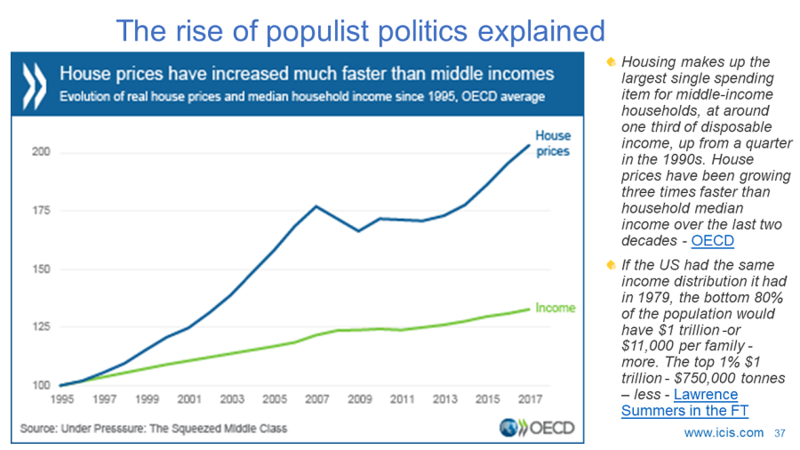 We need historic data on income levels, internet sales and other PE end-use applications at the level of the provinces and other administrative regions. Some PE is being consumed for exports as finished goods, so this needs to be subtracted from our historic calculations of income levels over PE (per capita PE consumption) at the level of the regions. Then we need to predict how we see income levels and internet sales etc. growing at the level of the different regions – along with the export of finished goods made from, or packaged in, PE. And finally, think about income thresholds. 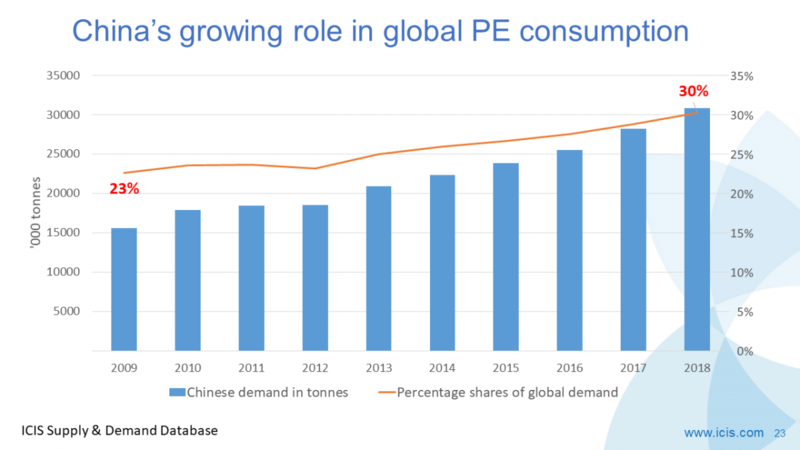 Is the big kick-off point for Chinese PE consumption when people move from earning $15 a day to $20 a day? If so, look at regional historic patterns of income growth at $20 or above and forecast the future number of people reaching the $20 level. Impossible? We don’t know until we try. A halfway solution would be better than no solution at all and all us remaining in the dark about PE growth prospects in the world’s most important PE market.